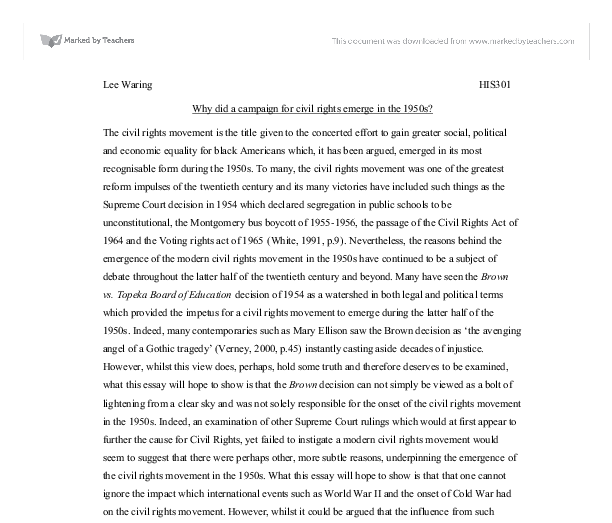 Lee Waring HIS301 Why did a campaign for civil rights emerge in the 1950s? The civil rights movement is the title given to the concerted effort to gain greater social, political and economic equality for black Americans which, it has been argued, emerged in its most recognisable form during the 1950s. To many, the civil rights movement was one of the greatest reform impulses of the twentieth century and its many victories have included such things as the Supreme Court decision in 1954 which declared segregation in public schools to be unconstitutional, the Montgomery bus boycott of 1955-1956, the passage of the Civil Rights Act of 1964 and the Voting rights act of 1965 (White, 1991, p.9). 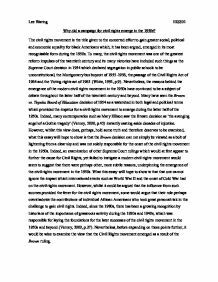 Nevertheless, the reasons behind the emergence of the modern civil rights movement in the 1950s have continued to be a subject of debate throughout the latter half of the twentieth century and beyond. Many have seen the Brown vs. Topeka Board of Education decision of 1954 as a watershed in both legal and political terms which provided the impetus for a civil rights movement to emerge during the latter half of the 1950s. Indeed, many contemporaries such as Mary Ellison saw the Brown decision as 'the avenging angel of a Gothic tragedy' (Verney, 2000, p.45) instantly casting aside decades of injustice. However, whilst this view does, perhaps, hold some truth and therefore deserves to be examined, what this essay will hope to show is that the Brown decision can not simply be viewed as a bolt of lightening from a clear sky and was not solely responsible for the onset of the civil rights movement in the 1950s. Indeed, an examination of other Supreme Court rulings which would at first appear to further the cause for Civil Rights, yet failed to instigate a modern civil rights movement would seem to suggest that there were perhaps other, more subtle reasons, underpinning the emergence of the civil rights movement in the 1950s. ...read more. World War II provided new and unusual employment opportunities for African Americans, which was then sustained by post war growth. This meant that many African Americans were better placed to provide resources and leadership for organisations devoted to their cause (Heale, 2004, p.157). For example, in 1939 the NAACP only had 54 000 member, yet by 1945 this figure had grown to over 500 000 (Heale, 2004, p.160). At the same time these increases in industrial production created new job opportunities and between 1941 and 1946 over 1 million African Americans left the south for employment in the North. However, whilst it could be argued that this shift, in many ways simply mirrored that of the great migration of the First World War, the attitude of the black Americans to World War II was notably different and it is this change in attitude at a grassroots level which, perhaps, helps to explain why the civil right movement emerged in the 1950s, where it had failed to emerge in the past. In 1917, African Americans were mainly apathetic or at least supported America's entry into the War; however their entry into the Second World War saw greater signs of black militancy (Verney, 2000, pp.32-3). This heightened black assertiveness was expressed in a variety of ways during the war, for example in the 'Double v' campaign waged against Hitler abroad and discrimination at home. Capitalising on this grass roots mood, A. P. Randolph launched the March on Washington Movement (MOWM) which, when threatened, led Franklin Roosevelt to issue executive order 8802 which established the Committee on Fair Employment Practices. This action marked the first time that collective non violent direct action on the part of the black community had led the federal government into taking affirmative action on a civil rights issue. In this case it was simply to ensure that any company seeking defence contracts included a clause which ensured that they did not discriminate. ...read more. To do so would ignore the previous decades during which concerted efforts were made to achieve an improvement in the civil rights of African Americans from both above and below. Arguably, had it not been for events such as the Cold War which, to go back to Fairclough's metaphor, eventually 'brought down the curtain on the first act of the drama' (Cook, 1998, p.9), the modern civil rights movement may well have begun during the 1940s or earlier. It is in this context that one should view the part played by the Brown ruling as, arguably, the Brown ruling played the leading role in the second act of the civil rights movement. In that respect Brown can, perhaps, help to explain why the modern civil rights movement emerged in the 1950s. However, notwithstanding some of the setbacks created by the Cold War, the many changes to the economic and political position of blacks which occurred during the 1930s and 1940s; together with the numerous court rulings which ruled in favour of civil rights issues; as well as the part played by veterans who came back from World War II to demand their citizenship rights, collectively helped to provide the inspiration for those who carried forward the struggle during the 1950s. Nevertheless, whilst events like World War II and the Brown decision were clearly important, and perhaps go some way towards explaining why the civil rights movement emerged during the 1950s due to the new contexts and new possibilities which they helped to create; one cannot ignore that the existence of favourable conditions does not necessarily guarantee that collective action will materialise. Indeed, 'whilst structural prerequisites may be conducive to collective action, without human agency such conditions will never be recognised, let alone exploited' (Chafe, 2003, p.172). Arguably therefore, the thread that linked all of these conditions, which happened to be present during the mid 1950s and was, perhaps, revitalised by the Brown ruling, was an awareness of the need for and potential strength of, direct action at a grass-roots level in order to facilitate change. ...read more. support free peoples who are resisting attempted subjugation by armed minorities or by outside pressures" (Avalon). The first "way of life" is democracy, and the second is communism. Truman is saying that it is the United States' duty to help those oppressed by Communism and to control the spread of it. work out more clearly his understanding of Gandhi's principle of non-violent persuasion, which King had determined to use as his main instrument of social protest. counties and pressured the U.S. Senate to approve a bill to fund the construction of low-income housing. But SCLC's broadened agenda for social change increased criticism by white officials. Abernathy also led SCLC in supporting striking hospital workers in Charleston, South Carolina, in 1969. One policeman even went as far as to turn fire hoses on the blacks, as well as setting dogs on them. The Events at Birmingham, Alabama in 1963 The city authorities of Birmingham Alabama, closed parks, playing fields, swimming pools as well as other public facilities to avoid integration. James Colaiaco claims: "Freedom Rides supplied an important strategic lesson for King... white racists had to be provoked to use violence against non-violent protestors. "2 Thus, King's ideals of non-violence were revised and made effective by Farmer, showing comparative weakness in King's strategy. Blacks became seen more, more common in the now crowded cities. Whites and Blacks lived and worked together closer now than every before. More and more whites came into greater contact then they ever had before. There protests now got them greater coverage from the media and therefore from Whites. Police attacked sternly forced this law greatly reviled. Their lives got ruined because if their pass was not in order they had to work day in day out at white people's plantations without getting paid, and they got beaten up as well. The importance of Lyndon Johnson in bringing about Civil Rights. Often, too much credit is given to people like Martin Luther King, when, a lot of the time, it is the main populace who take action. It was women who boycotted the buses after Rosa Parks was arrested, which was a huge success.